Place the tuna in a bowl. Add all the ingredients, except for the lettuce leaves. 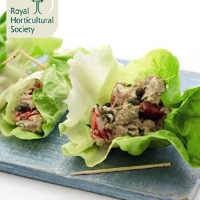 Lay out the lettuce leaves and divide the tuna mix between them. Gently roll the lettuce leaves, folding in the sides to hold in the filling. Secure with a cocktail stick.